Baron Toaldo M., Romito G., Cipone M., Diana A., Tursi M. Electrocardiographic, echocardiographic, and left atrial strain imaging features of a dog with atrial flutter and third-degree atrioventricular block // J Vet Cardiol. 2017 Oct;19(5):462-468. A 14-year-old American Staffordshire terrier was presented for episodes of exercise-induced syncope. At admission, atrial flutter coupled to third-degree atrioventricular block was diagnosed electrocardiographically. On the second day of hospitalization, surface electrocardiogram revealed spontaneous conversion to sinus rhythm with persistence of atrioventricular block. Complete transthoracic echocardiograms were performed after each electrocardiographic examination. The combined use of conventional echocardiography with tissue Doppler imaging-based modalities allowed to investigate the atrial electromechanical correlation and function during typical atrial flutter and after its resolution. A 14-year-old 25-kg male American Staffordshire terrier was presented to the Veterinary Teaching Hospital of the University of Bologna for episodes of exercise-induced syncope within a 2-day period. A diagnosis of decompensated myxomatous mitral valve disease (MMVD) with no evidence of rhythm disturbance had been made three months before and treated with furosemidec (2 mg/kg PO q12h), benazeprild (0.25 mg/kg PO q24h), and pimobendan,ef (0.25 mg/kg PO q12h). On arrival, the patient was laterally recumbent and minimally responsive. Mucous membranes were pale with a capillary refill time of 3 s and rectal temperature was 37 °C. The femoral pulse was severely bradyarrhythmic (25 beats/min). A grade IV/VI holosystolic left-sided murmur was also auscultated. On 12-lead surface ECG, isoelectric baseline and sinus P waves were replaced by sequential sawtooth-shaped deflections (F waves). The atrial and ventricular rates were 365 and 25 beats/min, respectively, with lack of association between the F waves and QRS. The QRS complexes had normal amplitude (Rwave, 1.8 mV; upper reference limit, <2.5 mV) and axis (100°; reference range, from 40° to 110°) but were wide (0.11 s; upper refer¬ence limit, <0.06 s). By means of these findings, AFL coupled to 3AVB was diagnosed [1,2]. c Diuren, Teknofarma S.p.A., Torino, Italy. d Fortekor, Novartis Animal Health S.p.A., Origgio (VA), Italy. e Vetmedin, Boehringer Ingelheim Vetmedica, Inc., Ingelheim, Germany. f iU22 ultrasound system, Philips Medical Systems S.p.A., Monza, Italy. A standard transthoracic echocardiography (TTE) was performed with continuous electrocardiogram monitoring. The two-dimensional echocardiography recorded from the left parasternal apical four-chamber (LAp4Ch) view (Video 1) clearly depicted the remarkable asynchrony between the rapid atrial contractions and the extremely low ventricular response. Thickening and prolapse of atrioventricular valves coupled to left atrial (LA) enlargement was also noticed (LA-to-aorta ratio, 2; upper reference limit, <1.6), consistent with MMVD. Pulsed-wave Doppler interrogation of transmitral flow was also performed (Fig. I, available in Supplemental Material on-line). Left atrial deformation analysis was carried using tissue Doppler imaging (TDI), as previously described in healthy dogs . The tissue Doppler imaging (TDI) color sector was activated to include the entire LA wall obtained from an optimized LAp4Ch view. A videoclip was acquired and analyzed off-line using a dedicated softwareg (Fig. 2). A region of interest (purple arrow) was drawn over the LA lateral wall segment. Then, the software automatically generated the strain time/intensity curve over each cardiac cycle (Fig. 3). Specifically, the strain profile expressed as a percentage over time showed a first positive wave during ventricular systole (s), a first deep negative deflection during early diastolic strain (e), and several negative waves in accordance to each F wave (f). g QLAB quantification software, version 9.1, Philips Healthcare. A sawtooth baseline characterized by sequential deflections (F) with uniform morphology, constant cycle length (165 ms), and uniform polarity in caudoventral leads is evident. Notice the discrepancy between the rapid atrial rate (365 beats/ min) and the slow escape rhythm (25 beats/min) due to the simultaneous third-degree atrioventricular block. Paper speed: 50 mm/s. Amplitude: 10 mm/1 mV. ECG, electrocardiography. Left apical four-chamber view focused on the visualization of the LA interatrial septum and lateral wall. Color-coded tissue Doppler imaging is active and a region of interest (purple arrow) is drawn over the entire lateral wall using dedicated software. LA, left atrium; LW, lateral wall. The dog was hospitalized with cage rest coupled to continuous ECG monitoring and transvenous pacemaker implantation was recommended to the owner. On day 2 of hospitalization, the dog’s atrial electrical activity spontaneously converted from AFL to sinus rhythm (SR). Sinus P waves had normal axis (78°; reference range, from -18° to 90°), amplitude (0.2 mV; upper reference limit, <0.4 mV), and duration (0.04 s; upper reference limit, <0.04 s) but were dissociated by the QRS complexes. The sinus rate ranged from 140 to 180 beats/min, whereas the mean ventricular rate was similar to the previously recorded ECG (25 beats/min). The ventricular escape beats were wide (0.13 s) and had a right bundle-branch block morphology (axis, -74°). Accordingly, sinus arrhythmia with 3AVB and ventricular escape rhythm was diagnosed . Interestingly, the fourth P wave showed a distinct morphology, with an infero-superior and rightward oriented axis (-104°). Moreover, the P to P interval between the abnormal P wave and the previous and following normally appearing P waves was longer than the other PP intervals. Therefore a delayed activation of an ectopic focus arising inferiorly from the LA was hypothesized . Image interpretation: Video 2 and Fig. 5. SR with 3AVB—conventional TTE and LA deformation analysis On two-dimensional echocardiography recorded from the LAp4Ch view (Video 2), atrial contraction occurred at a normal rate. Nevertheless, asynchrony between atria and ventricles was still evi¬dent due to the persistent 3AVB. Pulsed-wave Doppler analysis of transmitral flow was repeated (Fig. II, available in Supplemental Material online). The TDI-derived LA strain profile (Fig. 5) of the lateral wall showed the presence of a positive deflection during ventricular systole. Discreet negative peaks secondary to active atrial contractions (a) occurred after each P wave on the ECG. A significant reduction in mean peak late diastolic strain (a waves; ranging from -2% to -6%; mean value, -3%; normal value, -0.9 ± 1.1%) comparing to those displaced in Fig. 3 (namely f waves; ranging from -6% to -12%; mean value, -8%) was also evident. The tissue Doppler imaging-based profiles of strain is characterized by a positive peak during ventricular systole (s), followed by a first negative peak during early diastole (e) and several repetitive negative deflections (f) during each active atrial contraction mediated by flutter waves. On the x axis, time is expressed as s. On the y axis, deformation values are expressed as percentage. The previously described atrial flutter is replaced by sinus P waves occurring independently from QRS com¬plexes at a rate of 140—180 beats/min. The fourth P wave has a different morphology indicating a possible ectopic atrial beat arising inferiorly from the left atrium. Notice the slow ventricular escape rhythm (mean rate, 25 beats/ min) characterized by wide QRS complexes. Paper speed: 50 mm/s. Amplitude: 10 mm/1 mV. ECG, electrocardiography. The systolic (s) waves are still present; however, f waves are replaced by a waves following each P wave on the ECG trace. Notice a significant reduction in the mean late diastolic peaks compared with what recorded in Fig. 4. On the x axis, time is expressed as sec. On the y axis, deformation values are expressed as	percentage. ECG, electrocardiography. Transvenous pacemaker implantation was declined by the owner, and the dog was then euthanized. On gross examination of the heart moderate dilatation of LA and left ventricle were observed. Both mitral leaflets were thickened and a focal, irregular endocardial erosion, dorsal to the posterior leaflet of the mitral valve (Fig. 6A), was found. The histopathological examination showed myxomatous degeneration of both mitral leaflets. The erosion on the LA wall was represented by eosinophilic amorphous material (positive for Congo red) associated with mild lymphoplasmacytic inflammation. Gross examination of the mitral valve, which has thickened and deformed leaflets as a result of myxomatous degeneration. Dorsally to posterior mitral valve, leaflet presence of a focal ulceration of 1.5 cm in diameter (arrow; A). Section of the interventricular septum with severe thickening of the wall of the medium size intramural arteries with reduction of their lumen (B). Histologic section of the LV free wall that shows sparse amorphous compact and eosinophilic material (left and upper part of the image) close to normal myocardial fibers (right and bottom part of the image), consistent with a large area of replacement fibrosis (C). Section of the right atrium with evidence of a moderate, inflammatory interstitial infiltrate (mixed leukocyte infiltration), suggestive of chronic myocarditis (D). HE, hematoxylin eosin. The same eosinophilic material was present in the intima-media layers of the ascending aorta, intra¬mural coronary arteries (Fig. 6B), atrioventricular junction, and interventricular septum, where it was possible to identify, in multiple serial sections, the involvement of the bundle of His. Histological examination also revealed multifocal, severe replacement fibrosis of left ventricle free wall (Fig. 6C) and multifocal, moderate lymphoplasmacytic inflammation of the right atrium (RA), including the terminal sulcus (Fig. 6D). Based on these findings, MMVD associated to LA endocardial jet lesions, diffuse ventricular replacement fibrosis, arteriosclerosis, and RA myocarditis was diagnosed. Atrial flutter is the most common RA macroreentrant tachycardia in dogs [1,2]. 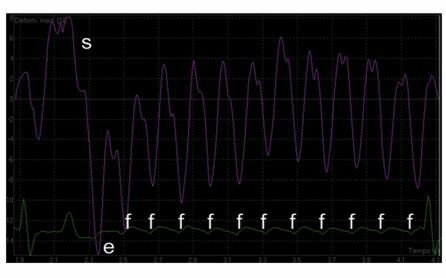 On surface ECG, the continuous atrial activation results in a sawtooth configuration characterized by sequential deflections (F waves) without a rest phase between them and an atrial rate typically ranging from 300 to 500 beats/min . Although ven¬tricular response is usually rapid and irregular, a regular slow ventricular rhythm may rarely develop in case of simultaneous 3AVB . Supraventricular tachyarrhythmias have been demon¬strated to induce atrial remodeling, inevitably affecting atrial function. Non-invasive assessment of atrial function is mainly performed by standard echocardiographic parameters and Doppler analysis of transmitral and pulmonic vein flow . These methods have been also used in patients with AFL to better characterize the arrhythmia and atrial mechanical function [5,6]. Recently, tissue Doppler imaging (TDI) and strain have emerged as alternative methods aimed to accurately measure myocardial deformation properties in several cardiovascular disorders, including atrial tachyarrhythmias affecting both humans and horses [7,8]. Indeed these echocardiographic methods have been shown to accurately identify abnormal mechanical atrial function and dyssynchrony in patients with AFL being able not only to predict the areas of atrial muscular abnormalities but also to quantify the degree of myocardial contractile dysfunction as a cause or consequence of the arrhythmia . Little is known about application of tissue Doppler imaging (TDI) for the assessment of atrial function in dogs . In the case here described TDI-derived late diastolic strain values during AFL showed much higher negative values compared with what has been previously published in normal dogs . This phenomenon could be explained by the Bowditch-Treppe effect, where an increase in heart rate can lead to an increase in the force of contraction due to a frequency-dependent force generation involving the calcium homeostasis at the level of the sarcoplasmatic reticulum . Moreover strain values decreased significantly after the restoration of SR, changing from a mean strain value of -8% during AFL, to -3% during SR. Such significant change was unlikely to be completely explainable by the simple day-to-day variation of our measurements, since the between-day variability of this specific variable has been demonstrated to approximate only 15% in healthy dogs . Other possible explanations included loss of Bowditch-Treppe effect and "atrial stunning”, in which there is a paradoxical reduction in the LA and LA appendage blood flow velocities following conversion . Usually atrial stunning is a transient condition that progressively resolves over time when SR is maintained . The underlying mechanism leading to atrial stunning seems not necessarily to be caused by a disruption of the contractile apparatus itself, but more likely due to an actual or relative intracellular calcium deficiency . The strain results obtained after spon¬taneous cardioversion approached those published in normal dogs . It has been shown through speckle tracking echocardiography, that LA function declines with increased severity of myxomatous mitral valve disease (MMVD) . Therefore, we cannot exclude that the disease itself had an influence on strain results in the presented case, making it difficult to understand if the actual LA function returned to normality or subnormality. Ideally longitudinal follow up of LA strain in the same subject would have helped to better understand the actual changes in atrial function over time. In the case here reported the postmortem evaluation not only allowed to properly correlate the echocardiographic features with the under¬lying cardiac structural abnormalities but was also helpful for a better understanding of the occur¬rence of the rhythm disturbances. Specifically, the diffuse fibrosis involving the atrioventricular junction area associated to the chronic myxomatous mitral valve disease (MMVD), and the RA myocarditis detected histologically were hypothesized to represent the main, presumptive arrhythmogenic predisposing factor for the devel¬opment of 3AVB and AFL, respectively. In conclusion, the images here reported provide visual evidence of AFL coupled to 3AVB in a dog, a possible complication of canine myxomatous mitral valve disease (MMVD) disease and RA myocarditis. In addition, this case illustrates how tissue Doppler imaging (TDI) modalities can be applied in combination with standard echocardiography to investigate atrial electromechanical correlation and function during AFL and after its resolution. Machen MC, Estrada AH, Prosek R. ECG of the month. J Am Vet Med Assoc 2008;233:1694-6. Santilli RA, Ramera L, Perego M, Moretti P, Spadacini GM. Radiofrequency catheter ablation of atypical atrial flutter in dogs. J Vet Cardiol 2014;16:9-17. Baron Toaldo M, Guglielmini C, Diana A, Sarcinella F, Cipone M. Feasibility and reproducibility of echocardio- graphic assessment of regional left atrial deformation and synchrony by tissue Doppler ultrasonographic imaging in healthy dogs. Am J Vet Res 2014;75:59-66. Ellenbogen KA, Stambler BS. Atrial tachycardia. In: Zipes DP, Jalife J, editors. Cardiac Electrophysiology. From Cell to Bedside. 6th ed. Philadelphia: Elsevier Saunders; 2014. p. 699-722. Ro,ca M, Lancellotti P, Popescu BA, Pierard LA. Left atrial function: pathophysiology, echocardiographic assessment, and clinical applications. Heart 2011;97:1982-9. Kahn IA. Transient atrial mechanical dysfunction (stun¬ning) after cardioversion of atrial fibrillation and flutter. Am Heart J 2002;144:11-22. Mustafa Y, Buchbinder NA, Peter CT, Naqvi TZ. Differential atrial stunning after electrical cardioversion: an echo tissue Doppler case study. J Am Soc Echocardiogr 2001;14:834-7. Decloedt A, Verheyen T, Van Der Vekens N, Sys S, De Clercq D, van Loon G. Long-term follow-up of atrial function after cardioversion of atrial fibrillation in horses. Vet J 2013;197:583-8. Mori S, Tada N, Sakurai M, Suzuki K, Takizawa K, Ootomo T, Mitsuoka M, Ito Y, Inoue N, Meguro T. Interatrial mechanical dyssynchrony shown by tissue Doppler imaging during atrial flutter. J Clin Ulatrasound 2012;40:247-51. Sanders P, Morton JB, Morgan JG, Davidson NC, Spence SJ, Vohra JK, Kalman JM, Sparks PB. Reversal of atrial mechanical stunning after cardioversion of atrial arrhythmias. Circulation 2002;106:1806-13. Baron Toaldo M, Romito G, Guglielmini C, Diana A, Contiero B, Pelle NG, Cipone M. Assessment of left atrial deformation and function using two-dimensional speckle tracking echocardiography in healthy dogs and dogs with myxomatous mitral valve disease. J Vet Intern Med 2017; 31:641-9.